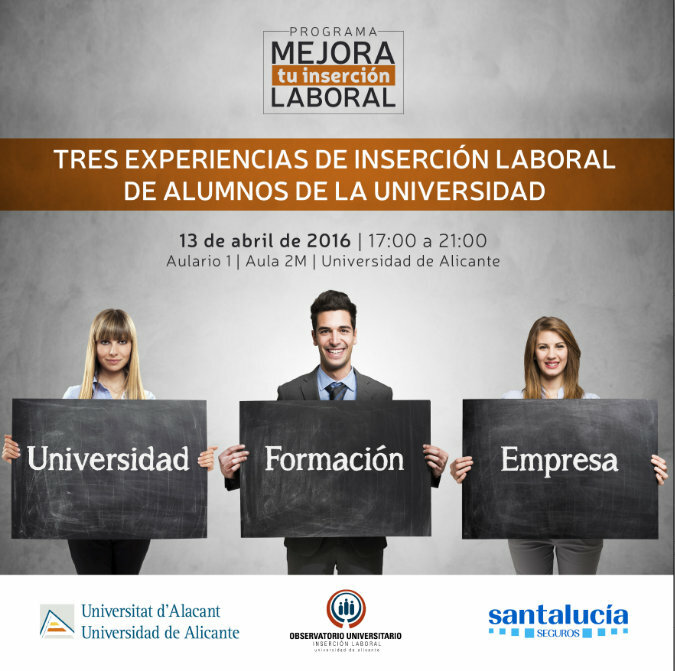 The next 13 April 2016, of 17:00 to 21:00 in the Aulario 1 - Classroom 2M, will llevar the fourth session of the Program of Improvement of Insertion Laboral of the University of Alicante, developed with the collaboration of Santalucía Safe. Along this new session will centre us in knowing "Three experiences of labour insertion of students of the University". Juan Antonio Ubeda. Manager in Villena. Ancient student of the University of Alicante. Susana Checa. Inspector in Elche. Ancient student of the University of Alicante. Alba Yebra. Monitora In Granada. Student of the University of Granada that participated in the Days of University Insertion, incorporandose to an agency like commercial. To day of today is monitora and commissions of a team of production.